Heaven fascinates us, yet we lack any empirical information about it. Why, despite our multiple faith traditions, does Heaven have such positive connotations for us all? Why, despite no tangible evidence, should autobiographies by authors who claim to have visited Heaven, usually through near death experiences, attract literally millions of readers? Why does virtually everyone, even non-believers, agree with the old adage that “There is nothing better than Heaven”? Since a picture is worth a thousand words, Heaven on My Mind will focus more on true stories than on explication. 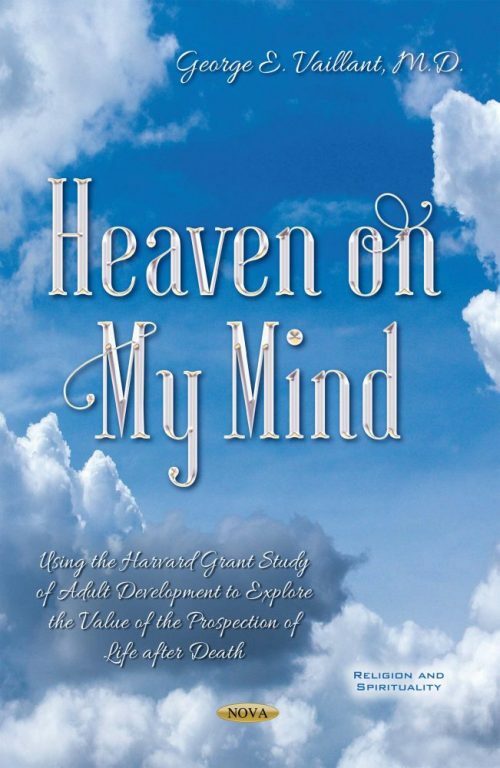 In this book, the author shows how the prospectively gathered spiritual and religious biographies of the men in Harvard’s legendary Study of Adult Development (The Grant Study) cast light upon the significance of faith and hope for love in Heaven in real lives. The author intends to show that putting the newly discovered concept of prospection together with our ancient faith in heaven allows us to understand the value of ruminating on an afterlife. Indeed, the life histories of the 184 men followed for their life-time in Harvard’s path-breaking Study of Adult Development faith in Heaven is significantly associated with leading more successful lives. Due to recent advances in neurophysiology, the study of prospection reflects a paradigm shift in our understanding of the human mind. Prospection reflects the fact that the brain combines incoming information with stored information to build “mental representations” of the external world. The author received a Templeton grant to study prospection by reanalyzing The Harvard Study of Adult Development (The Grant Study). Since 1939, the landmark Grant Study has conducted a prospective – in contrast to retrospective – lifelong social and medical study of a cohort of healthy college males. In order to document whether religious affiliation increased over time, beginning at age 47, every 6 years the author, as the longtime Grant Study Director, has asked the men about the intensity of their religious affiliation and the degree of their belief in life after death. Heaven on My Mind uses these spiritual and religious biographies to illuminate the significance of faith and hope for Heaven. In short, Heaven on My Mind will reflect the “natural history” of the men’s religious affiliation and their prospection of, and expectations about Heaven over the course of their lives. Chapter 1. Why Should Heaven Interest Us? Chapter 2. Why Should Prospection Interest Us? Chapter 4. Does Humanism Keep Heaven From Our Minds? Chapter 5. Why Should Faith Interest Us? Chapter 8. Why Do Some Of Us Become More Religious with Age? Chapter 9. Why Does Loss of Faith Happen? Chapter 11. Is Our Capacity for Spirituality Evolving?